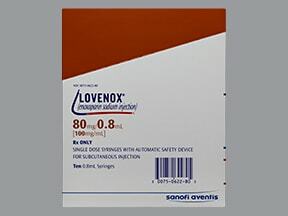 Who should not take Lovenox Syringe? Enoxaparin is used to prevent and treat harmful blood clots. This helps to reduce the risk of a stroke or heart attack. This medication helps keep your blood flowing smoothly by lowering the activity of clotting proteins in the blood. Enoxaparin is an anticoagulant, also known as a "blood thinner." It is a type of heparin. Conditions which increase your risk of developing blood clots include certain types of surgeries (such as knee/hip replacement, abdominal), long periods of being immobile, certain types of heart attack, and a specific type of chest pain called unstable angina. For some medical conditions, enoxaparin may be used in combination with other "blood thinners. Read the Patient Information Leaflet if available from your pharmacist before you start using enoxaparin and each time you get a refill. If you have any questions, ask your doctor or pharmacist. This medication is given by injection under the skin as directed by your doctor, usually once or twice a day in the abdomen (at least 2 inches from your belly button). Do not inject into a muscle. The dosage and length of treatment are based on your medical condition and response to treatment. The dosage may also be based on your age and weight for some conditions. Use this medication regularly to get the most benefit from it. To help you remember, use it at the same time(s) each day. If you are using this medication at home, learn all preparation and usage instructions from your health care professional and the product package. Before using, check this product visually for particles or discoloration. If either is present, do not use the liquid. Before injecting each dose, clean the injection site with rubbing alcohol. Change the injection site each time to lessen injury under the skin. To minimize bruising, do not rub the injection site after a shot. Learn how to store and discard medical supplies safely. This medication may also be given by injection into a vein by a health care professional, as directed by your doctor. What conditions does Lovenox Syringe treat? Mild irritation, pain, bruising, redness, and swelling at the injection site may occur. Fatigue or fever may also occur. If any of these effects persist or worsen, tell your doctor or pharmacist promptly. This medication can cause bleeding if its effect on your blood clotting proteins is too much. Tell your doctor right away if you have any serious signs of bleeding, including: unusual pain/swelling/discomfort, unusual or prolonged bleeding, unusual or easy bruising, dark urine, black stools, severe headache, confusion, vision changes, unusual dizziness, fainting, seizures, weakness, numbness. 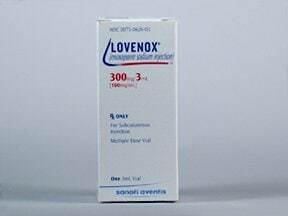 List Lovenox Syringe side effects by likelihood and severity. Before using enoxaparin, tell your doctor or pharmacist if you are allergic to it; or to heparin or pork products; or if you have any other allergies. This product may contain inactive ingredients, which can cause allergic reactions or other problems. Talk to your pharmacist for more details. Before using enoxaparin, tell your doctor or pharmacist your medical history, especially of: serious active bleeding, artificial heart valve(s), kidney disease, liver disease, bleeding or blood disorders (such as low platelet counts), low platelet counts after previous heparin treatment, stroke, uncontrolled severe high blood pressure, certain eye problems (such as diabetic retinopathy), certain stomach/intestinal problems (such as active or recent ulcers), recent spinal procedure or puncture, spine problems (such as spinal deformity), recent eye/brain/spinal cord surgery. Limit alcohol while taking this drug because it may increase the risk of stomach bleeding. During pregnancy, this medication should be used only when clearly needed. Discuss the risks and benefits with your doctor. Pregnant women with artificial heart valves need close monitoring (see Notes). What should I know regarding pregnancy, nursing and administering Lovenox Syringe to children or the elderly? A product that may interact with this drug is: mifepristone. Check all prescription and nonprescription medicine labels carefully since many medications contain pain relievers/fever reducers (NSAIDs such as ibuprofen, naproxen, or aspirin) which can increase the risk of bleeding/anti-platelet effect when used with enoxaparin. However, if your doctor has directed you to take low-dose aspirin for heart attack or stroke prevention (usually at dosages of 81-325 milligrams a day), you should continue taking it unless your doctor instructs you otherwise. Ask your doctor or pharmacist for more details. 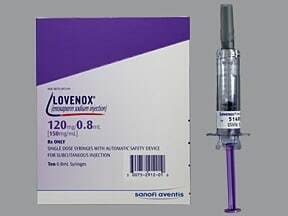 Does Lovenox Syringe interact with other medications? Laboratory and/or medical tests (such as blood counts including platelets, checking your stool for blood) should be performed periodically to monitor your progress or check for side effects. Additional lab tests (anti-factor Xa blood levels) should be performed in certain cases, especially if you have kidney disease, are pregnant and have artificial heart valves, or to check if enoxaparin is working well for you. Consult your doctor for more details. Do not store the multiple dose vials for more than 28 days after the first use. 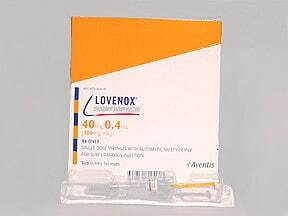 Are you taking Lovenox Syringe? Are you considering switching to Lovenox Syringe? How long have you been taking Lovenox Syringe? What's the Right Hemophilia Treatment?